Lemon Tea Tree Oil (leptosperum petersoni) originates in Queensland (Australia) and is steam distilled from from a relative of the more common 'Tea Tree' - both being of the Myrtaceae family. The oil has a pleasant, 'round' lemon scent, found by some to be smoother than lemongrass or citronella. Its bright fresh aroma is quite purifying. In low doses it can be stimulating, bringing relaxation with a little greater exposure. Diffused, it can clear the mind and be rejuvenating. 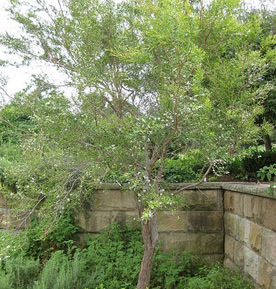 In general, its actions are considered similar to 'common' tea tree but with a more pleasant, less medicinal scent. Lemon Tea Tree is also considered one of the best odor controllers and is also effective when used in 'outdoor' products to help protect against external elements.